During a glorious fall season, I spend one-week in Minneapolis and Wisconsin that is simply euphoric. During the 3 1/2 days in Minneapolis, I ride on part of what appears to be about 50 miles worth of very scenic, popular, and enjoyable bicycle and pedestrian paths which weave though the city. Most of the mileage passes along the shores of the many creeks, lakes, and rivers in the city. The trails are so popular that despite the inclement weather (at least for a Floridian like me), there are large numbers of people using them. Of course, since I am here from thousands of miles away, I feel compelled to rent a bike and ride the paths. This despite my need to wear a heavy coat and gloves (it SNOWS on my biggest riding day—but I am not to be denied). I have always heard good things about the city, and am not disappointed. There are great restaurants, a lively cultural and political climate, a strong intellectual climate (due in part to the University of Minnesota), and progressive city infrastructure designs (besides the bike paths, they've done quite well with downtown renovations). Minneapolis is a university town, a river town, and a lake town. Downtown has been revitalized and now boasts a diversity of nightlife. In the city is one of the largest universities in the U.S. (University of Minnesota). The park system, with over 100 parks, is considered one of the best in the U.S. Minneapolis has one of the largest cash grain markets in the world, and is considered the capital of upper midwest agriculture. I am quite impressed by the waterfall at Minnehaha Park in the city. The city is by the St. Anthony Falls, the northward limit of navigation on the Mississippi River. It is a "twin city" with St. Paul. It was incorporated in 1856. The city contains four of the world's five largest grain milling companies, including General Mills and Pillsbury. The 3M Corporation is based here, and it is the base for Northwest Airlines. Minneapolis is well-known among planners for pioneering above-ground-level bridges (skywalks) between downtown buildings, which planners such as myself dislike since they detract from the critically important city street life. In 1991, 368,993 people lived in the city. My next stop is in rural Wisconsin, where I ride the nationally famous "Elroy-Sparta State Bicycle Trail." The trail is 30 miles long, and is the first rail-to-trail conversion in the U.S. 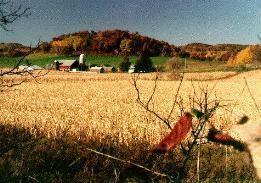 I ride it on a perfect fall morning through spectacular rural landscapes painted by the fall colors on the trees (see photo). At one point, I come to a 3,800-foot long tunnel which passes through a mountain. The tunnel was HAND-PICKED at the turn of the century. The sign at the entrance says you must use a flashlight and you must walk your bike. Thinking the sign was for sissies and children, I proceed to ride about 50 feet into the tunnel, whereupon I suddenly realize that the sign makes a reasonably prudent recommendation. I quickly discover that the darkness in the tunnel (there are no lights) makes me essentially blind. Large amounts of water drip from the ceiling and walls, creating dangerous (and invisible) ruts in the trail. The darkness puts me in fear of walking into the walls, and I only avoid doing so by keeping the small pin-hole of light at the end of the tunnel straight in front of me. The tunnel walk takes about 15 to 20 minutes to traverse, and it seems a lot longer. All in all, though, it is more fun than fright. 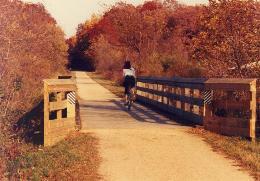 I hope to return soon to ride the full length of the trail. After Elroy-Sparta, I make my second trip to Madison in three years. Each time I visit this city, I like it more and more. There is so much political activity (protests, meetings, demonstrations, leafletting, etc.) that it seems that every activist in the U.S. has moved to Madison. The 40,000-student University of Wisconsin generates most of the energy, and provides support for a surprisingly wide range of cultural and culinary delights, considering the size of the city (170,000). Like Minneapolis, Madison has many miles of scenic and well-used bike and pedestrian paths which run along their many lakes. Unlike Minneapolis, though, the weather turns out to be sunny and 75 degrees on my longest ride day (of course, on the next day, it is 25 degrees and snowing). If the weather was more hospitable, I would probably end up living in Madison. It is a tremendous city. For example, the city features a vibrant, colorful State Street transit mall that links the capitol building to the university campus. And on each weekend during non-snow months, the grounds of the capitol building host a wonderful, friendly farmers market filled with delicious and fresh foods, and a delightful sense of community. Again, it is quite beautiful, and I look forward to returning to ride more of it. I shoot 2 1/2 rolls of film during the vacation. In 1994, 5,082,000 people lived in the state of Wisconsin.